Being friendly on Facebook can help you amass friends and followers alike, but sometimes a post can hit a nerve in some of your friends. Whether you post pictures of adorable pets or opinions about religion or your thoughts about a movie star, some of your Facebook friends are bound to disagree. Most will ignore you, and others will call you out, but a few will resort to the extreme solution to Facebook annoyance by unfriending you. Now your friends list seems smaller. Who performed the dastardly act of deleting amiable and cordial you from their list of friends? The new app Who Deleted Me gives you answers. 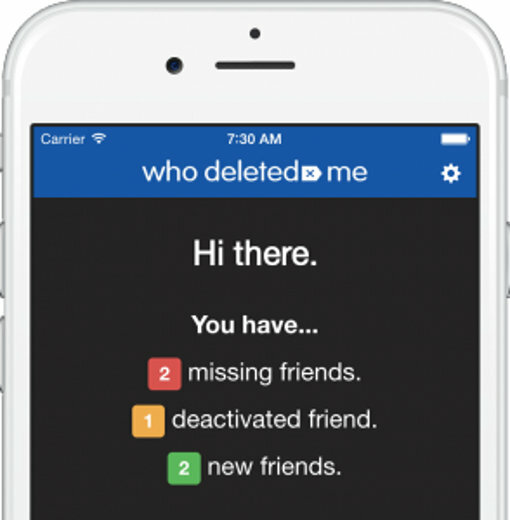 This app does one simple thing: it keeps track of your list of friends and checks if anyone has gone MIA the next time you log in to Facebook. It saves your friends list the first time you use the app. Each time you log in to Facebook, the app saves your friends list and compares it with the old list saved previously — that’s how the app knows who unfriended you. 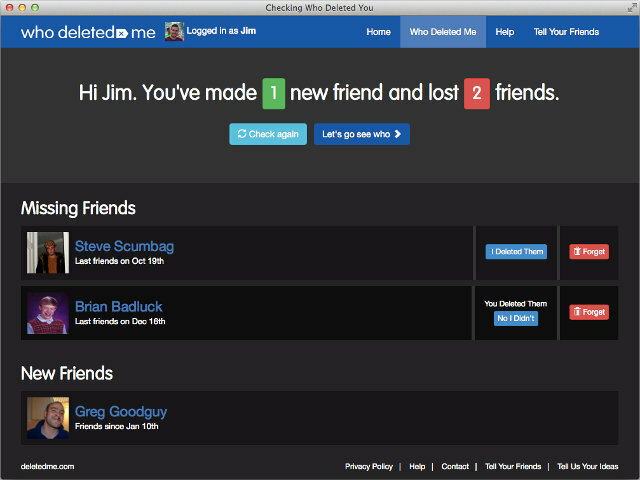 The app tells you not only how many of your friends are new but also who has deleted you from their friends lists. It will also inform you if any of your friends have deactivated their accounts. Notice that Who Deleted Me is no historical crystal ball that can tell you who might have unfriended you before you started using the app. If you find an app that claims it can do so, it’s most likely a scam. Who Deleted Me is available for both Android and iOS. You can also use the app via desktop browser extensions for Google Chrome and Mozilla Firefox. If you’re on the unfriending side of the equation, you might want to know how to unfriend your Facebook friends without offending them. I don’t know about the iOS version. Please let me know who unfriended me. Can’t pay for app until next month but would like to know when unfriended because I have never written or posted any responses on politics. I hate politics and it is doing enough damage to divide this nation.